When it comes to de-icing products, not all salts are the same. If you’ve ever purchased ice-melting salts before, you have probably seen the wide variety of options and price ranges available. The truth is, while some salts may be less expensive, they may also be more corrosive to concrete pavers and vehicles. Some are more expensive, and less corrosive. Some salts work at lower temperatures than others, and some are more environmentally friendly than others. Here are the three main types of de-icing salts available, and how to choose the one that’s right for you. Sodium chloride is the traditional halite rock salt for icy areas. It is an inexpensive rock salt that can be used on concrete pavers. However, when temperatures go below 15 degrees Fahrenheit, sodium chloride becomes ineffective. If sodium chloride is used on concrete pavers at temperatures below 15 degrees Fahrenheit, the melted brine in the pores of the concrete pavers can re-freeze and cause the pavers to crack and spall. 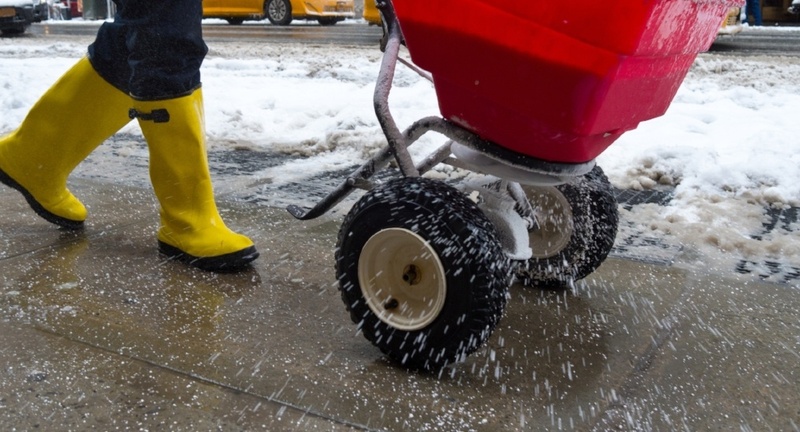 So, if you are using sodium chloride rock salt on your concrete pavers, make sure to pay attention to the temperature, and if the forecast predicts the temperature to go below 15 degrees Fahrenheit, you may want to consider a different type of salt. Calcium chloride ice melting products are often engineered to reduce tracking. This will tend to keep the ice melt product outside on the pavers and not tracked inside from foot traffic. This also reduces the degree to which the ice melt product gets moved around and pushed into the gaps between pavers, which can become an eyesore and difficult to remove. Calcium chloride products are effective in temperatures all the way down to -25 degrees Fahrenheit, decreasing the risk of any cracking or spalling concrete pavers. A third option, and one of the more popular choices for ice melt products, is calcium magnesium acetate. Many calcium magnesium acetate products are also engineered to reduce tracking. When used as directed, calcium magnesium acetate is not corrosive to metals, concrete, or wood, and is safer for vegetation, pets, and children. Calcium magnesium acetate is a natural acid, which is soluble in water, biodegradable, and much more environmentally friendly. Another way to protect your pavers from corrosion is to use less salt by adding sand to the mix. A mixture of 75% salt and 25% sand is effective. In addition to using less salt, you can also seal your pavers. Many paver sealers are very effective at protecting pavers from salt damage, and need only be applied once every 2 to 5 years depending on the amount of traffic and the quality of the sealer. Choosing non-corrosive salts and protecting your pavers with a sealer can add years of longevity to your paver patios, walkways, and driveways.